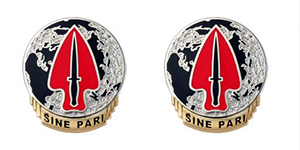 Army Special Operations Command Unit Crest are sold one pair per pack. On a silver and gold color metal and enamel device 1 3/16 inches (3.02 cm) in height a silver metal colored gridlined globe of the African, European and Asian continents as viewed from above the Northern Pole with a portion of the North American continent and Greenland visible to chief, all land masses filled black. Overall a stylized red spearhead bearing a black Fairbairn-Sykes dagger. Attached below the globe a pleated gold metal colored scroll inscribed with the Command motto "SINE PARI" in black letters.